There are plenty of companies and startups that want to disrupt the food ordering space including Seamless, GrubHub and others. A new competitor is entering the space today. ChowNow is an online ordering platform built for mobile and Facebook, and aims to provide restaurants with an easy way to offer online ordering to customers via either their Facebook page, branded mobile apps for iPhone and iPad or their existing web site. Unlike the two giants in the food ordering space, Seamless and GrubHub, which offer one site where you can find local restaurants and order; ChowNow isn’t a centralized platform for all restaurants. With ChowNow’s offering, restaurants can individually customize and brand their ordering apps. 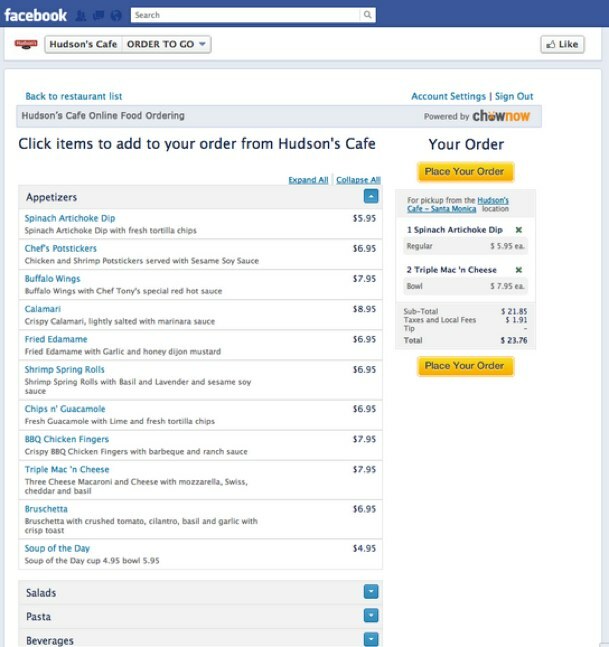 ChowNow is actually betting on Facebook as a destination for consumers to order food. Via the startup’s Facebook Ordering App, restaurants can take orders directly through their Facebook page. The startup says that because more than 70 percent of U.S. restaurants have a Facebook presence, and potential customers are flocking to the social network for engagement; Facebook makes sense as a possible destination. Restaurants can also create branded iPhone and iPad apps and can take orders through their existing website via an ordering widget. Additionally, ChowNow is offering restaurants a wireless tablet to receive orders and communicate back to the customer when it will be ready. The Android tablets are connected to Sprint’s 4G network and thus do not require the restaurant to supply anything but a wall outlet. ChowNow is available for a monthly subscription fee of $89. Christopher Webb, CEO of ChowNow, tells us that many restaurants simply can’t afford to not have a mobile and social presence but also can’t afford to pay thousands to create these platforms. Webb adds that the startup’s team are former employees from OpenTable and Seamless. ChowNow, which was part of incubator Launchpad LA, recently closed a seed round of $1 million from GRP Partners, Launchpad LA, James Bailey and angel investors.